As a picture book author/illustrator with 80% of my books out-of-print, I am leaping onto the Digital Train as it roars past my corner, with the prospect that many of these stories could be available once more. Last year I purchased my first iPhone. Then, I heard about apps (whats?) 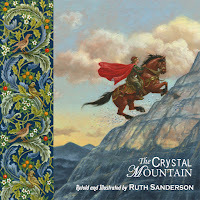 of picture books that read stories on the phone and showed the pictures from the book. Too cool! I decided to query an iPhone app producer, PicPocket Books. The owner, Lynette Mattke, was (happily!) a fan of my fairy tale picture books, and she expressed an interest in creating apps for Papa Gatto and The Crystal Mountain, for which I have had the rights reverted. I really had no idea how my work would translate to this medium. I downloaded Merry Christmas Curious George and Mr. Tickle—two of the early apps created for the iphone, and I studied them to see what exactly was being done. Since PicPocket was developing my apps with their own dime, I wanted to give them the freedom to create the product they felt would work the best. They created my two apps so that the story is read while seeing the text alone scrolling on the page, then the page turns, showing the picture alone with no sound. I liken it to when a teacher reads a page of a story to a group of children, then turns the book around to show them the picture. It works, and they did a lovely job on the production, but I feel that for a young child it would be preferable to have pictures on every page. The challenge is how to do that with a very long story, and all of my books tend to fit in that category. For the iPhone, and my long books, it would be close to impossible to achieve that goal, unless the text did not appear on the page while the story is read. In Curious George, there is an option to have no text shown on the page. The story is read as different parts of the picture are panned, zoomed in on, etc. This becomes more of an audiobook with pictures, similar to the story DVDs produced by Nutmeg Media. (They produced my Goldilocks and Mother Goose and Friends.) My books would work well like this, though many parents I’m sure would prefer the text to be shown, to encourage a child to begin to learn reading. The Mr. Tickle app uses the same picture for a number of pages, but zooms in closer each time, with a few lines of text at the bottom of each page. It is interesting that while neither Curious George nor Mr. Tickle are particularly long stories, they still had to be reformatted with extra pages of zooming and cropping, in order to work in a small format like the iPhone. My conclusion: shorter is sweeter, for iPhone picture book app stories. Because my stories are quite long, (and my pictures don't lend themselves to animation and other interactive app elements) I am now choosing to concentrate on producing ebooks versus apps, for the rest of my OP titles (though I'd still like to explore doing an app with pictures panning in and out and no text while it is being read.) The e-readers are larger (iPad and NOOKcolor and more appearing all the time) The books will still need some re-formatting, cropping, zooming, adding extra pages, so the text will not appear too small. I want to be very careful and make sure what I produce is a pleasing design, with pictures on every page, as well as being easy to read. I will also be buying lots of ebooks and studying how other people are solving these issues. This is such an exciting time. The dawn of a new way to share stories with children. There will always be parents that want to cuddle up with their child and the paper product called a “book,” but soon more and more parents will be cuddling up with their child and the NOOK or iPad, loaded with a library's worth of stories. I'm hoping a few of my books will be in that library. And maybe there will still be a few printed books on the (actual vs virtual) shelf as well. Thanks Ruth...I agree- Ap works best with small amount of type. I take it you will separate art from text when making your ebooks? You're work is amazing in ALL formats. I'm not sure, Maryann - I might overprint the text on light areas of the picture, or fade a dark section to overprint text, etc. Depends on the book and the picture layout. Which will take a while to design and figure out. Fascinating post, Ruth. I'm amazed at how complicated some of these issues are. Some picture books won't translate easily to smaller formats, it seems. And it looks like the new Android tablet is here, which will mean another larger ereader that supports color. And all of the tablet readers can play PDFs... might be the way to avoid having to reformat each title for each ebookstore...just a theory at this point! RE: Converting PDF files from the original book: I don't have an iPad yet, but I need to look at how small an 11x17inch spread from a book looks on a 6x8(? )inch screen. If the original text is only 13 point or so because of the length of the story it would only be around half of that on the iPad. Too small in my book! I'm thinking you won't be able to read the text unless you "pinch" it to enlarge that area. Sounds a bit clunnky. Books with larger type to begin with might be just fine. When I'm further along in the process I'll post about ebook-making adventures. Interesting post, Ruth. This helps clarify some of the issues for those of us dealing with picture books. So many choices and options and new things to consider. I agree that the text will have to be larger on the ebook readers than for a traditional book. If you have lots of text, I can see how that can create some problems. But nothing you can't solve. I'm sure your work will shine in all formats and on all devices––it's beautiful! I think this format works best with less copy too. I have the hard copy of Papa Gatto! I think we are just beginning to see what will be happening with picture books in a digital world.